So franchise development… Is that pushing the brand across media? A little bit. For instance, Alan Wake’s American Nightmare. The next steps of the franchise. where we take it – keeping it real with the universe. It’s about “Shall we do an Alan Wake top-down shooter?” And I’ll say No, we’re not doing an Alan Wake top-down shooter. That’s not somethign that fits into the franchise and that the fans will appreciate. Keeping an idea about where we’re taking the franchise and hopefully delivering something to the fans that they expect and want. 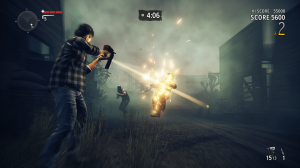 Can we expect to see lots of torches in American Nightmare? OH: Yup, you can expect the core combat mechanic to be making a comeback. It’s new and improved. We’re putting a lot of variation into the combat on the enemy side and the weapons side. The weapons that you have now in American Nightmare are very wild. You’ve got weapons that you haven’t seen before – a nail gun, crossbows and stuff like that. The enemies are very different. We’ve got a bunch of new enemies like the Bird Man – use your gun or your flashlight and he dissipates into a flock of birds and starts flapping around. Then he comes down and looks for a point to attack, swoops down to attack you and then dissipates again into a flock of birds. The splitter is another new enemy. Everything that we taught you in the first game – use your flashlight first and then use your conventional weapon – if use your flashlight on the Splitter at all, with light he splits into two. Use your flashlight again, he’ll split into two. Use your flare or flare gun, he’ll split into two. Any light source will make him split. Of course, there is strength in numbers. You need to choose your strategy carefully. So he’ll turn into a type of Sorcerer’s Apprentice? Little bits everywhere. OH: He gets gradually smaller so he’s one guy that becomes gradually smaller and duplicates himself so you can choose either to gkill him as one big guy but if you don’t have powerful enough weapons you might want to split him. if you have a gun that you could spray, you might want to split him. It’s about choosing your tactics. The grenadier – before in Alan Wake, all the enemies came after YOU. The grenadier is one that will keep his distance and run away from you. he’ll throw grenades at you – you need to hunt him down and kill him. Then there’s this massive, massive monster of a guy with a big circular saw. He’s really difficultt o kill. And you’re wondering how this all fits into Alan Wake. This is very strange, very different. You’re right. This is framed around an episode of Night Springs. If you remember, Night Springs in the original Alan Wake was the fictional TV show with the Twilight Zone feel to it. You’re actually playing an episode of Night Springs and this episode is written by Alan Wake. Wake has learned a lot since we saw him last and he’s now able to use fiction to his advantage. He is using that to defeat Mr Scratch. Mr Scratch is Wake’s evil double who was born after the events of the first game. After the first game, the dust settled in Bright Falls and the locals started to speak of Alan Wake as this rock star writer that had come to their small town with his wife and brutally mnurdered her. Now we know that’s not true but that’s the urban legend. That’s what’s being told. As we know in Bright Falls, fiction can become real and that’s how mr scratch was born. he wears the face of alan wake. That’s who we’re fighting against right now. Mr Scratch is really after Alice Wake and Alan is trying to stop him. Vehicle handling was a big no for our reviewer on the original Alan Wake. How are vehicles in American Nightmare? OH: There’s no vehicles here. There’s two modes – there’s a five hour story mode and an arcade/action mode called Fight Till Dawn which has five dfifferent maps. Once you’ve aced those maps you unlock Nightmare mode which is very, very difficult. We have online leaderboards where we can see who the real Champion of Light is. This is our version of Horde mode for Alan Wake. It’ll cost around £10 which is a pretty good deal. So are you moving more towards the episodic model? I’d say that the episodic model was something that we touched on with Alan Wake and it’s something that we’ll continue to do in whatever games that we do. We used this episodic structure because it’s a great way of telling stories in video games as opposed to this movie structure which gets really diluted in the video game. Works in a movie – an hour and half with three acts. For a video game between 10 and 20 hours, three acts is really running thin. This episodic format for us is a much better way to tell a story in a video game. Some unannounced stuff. In addition to that, we’re doing Death Rally on iOS. We’re not doing that in-house. We’re a small team of 60 people so we’re very focused on the in-house stuf fthat we do. The PC version of Alan Wake for instance, we also used a partner; a company called Nitro Games. Our tech team has been supporting them, of course. For Death Rally we’ve been taking more of a producer role. We’re working with a talented team called Mountain Sheep. American Nightmare we did in-house. Took us about 8 months development time. Fun stuff. More than ever before. Before, we’d work on one game for five years, four years, two years and then put that out. now we’re doing alittle bit of everything. it seems to be what all the smart kids are going – Bungie, Epic – they’re doing a little bit of everything as well. Alan Wake is out now on Steam for £22.99 and on Xbox 360 and PS3. The PC version will also be released in shops on 2nd March 2012. 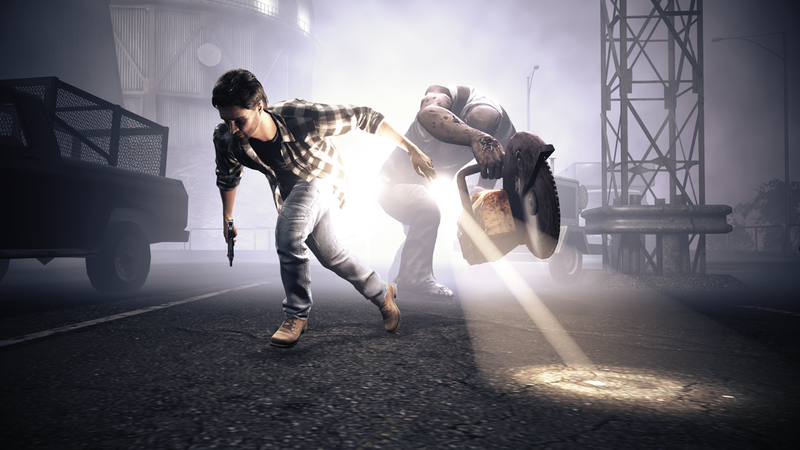 Alan Wake’s American Nightmare will be available on Xbox Live Arcade from 22nd February.